Entering Watersones’ Gower Street branch in central London the other day, I came face to face with a shelving bay full of old green Penguin crime novels. 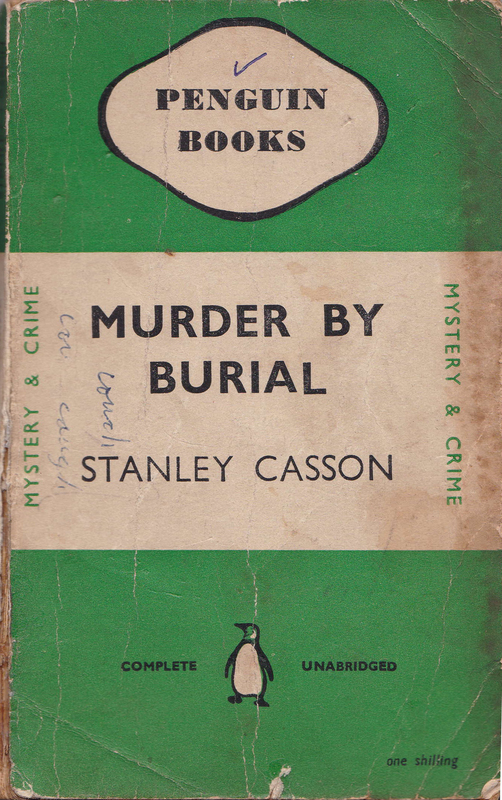 In the centre, at eye level, I was intrigued and delighted to find a battered copy of Stanley Casson’s Murder by Burial. Casson was a member of the Authors’ Club, and this 1938 murder mystery was a one-off jeu d’esprit by a distinguished archaeologist and authority on Ancient Greek sculpture, of whom I became aware while researching the Club’s history. Casson’s tastes were eclectic. His many publications ranged from The Technique Of Early Greek Sculpture (1933) through ‘Byzantium and Anglo-Saxon Sculpture’ to Some Modern Sculptors, a 1929 survey of the art from Rodin to Epstein – whom he, unlike some of his Authors’ Club colleagues, admired. One of his students at Oxford was Max Mallowan, the archaeologist who went on to marry Agatha Christie. When war was declared in 1939, Casson joined the Intelligence Corps with the rank of Lieutenant Colonel, and became an instructor at the Intelligence Training Centre in Matlock, Derbyshire. Among his pupils there was a young second lieutenant who shared his passion for Hellenic culture, and with whom he always conversed in Greek. His name was Patrick Leigh Fermor. Casson was setting up a military mission to his beloved Greece, to which he recruited Fermor, who would subsequently capture the commander of the German forces on Crete, General Heinrich Kreipe. In 1942, Casson published Greece Against the Axis, his eye-witness account of the Italian and German invasions of that country in 1940–41. In February 1944 Casson, along with Graham Greene, was invited to join the Authors’ Club’s executive committee. Before the next meeting, however, the club was shocked to learn that he had been killed in a plane crash off the coast of Cornwall while flying to Cairo on active service. The committee commissioned his wife to compile a memorial bibliography of his works, and once the war was over, on 29 November 1945, held a reception with the Anglo-Hellenic League at the Dorchester, at which tributes were paid to his life and work, and a collection was raised to fund a library of English books in Greece.